8-1-14 - DREAM I seemed to be in a school room, looking at a board. A man was with me who was the teacher. He was moving numbered letter symbols around the upper part of the board, which seemed like a number with one or two letters. When he was done moving them around, he said, "Now! 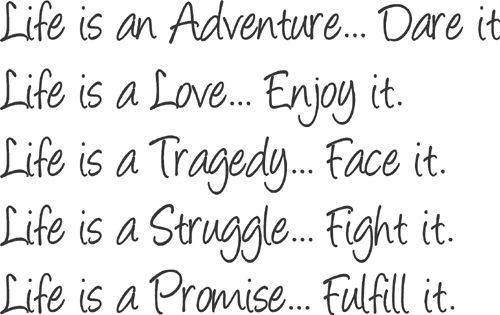 THAT is living!" NOTE: While I was researching this, a voice in my head said. "That's what is important to a Father. You totally missed it!" I'm sure he was referring to my Father's decision not to have me educated to go to college. He just wanted me to get the kind of education that would get me a job, because as he said to me. "Girls only go to college to find a man and get married." I got that message loud and clear. At age 13, I wanted to be a teacher and a librarian, which is why I'm obsessed with books and educating myself on many subjects, and when I worked, I went to night school for many different parts of my job, and the company paid for those courses. In business, the companies want their personnel to be educated. So I have a whole drawer full of certificates, and a house full of books on every imaginable topic you can think of. NOTE: BY THE TIME I GOT DOWN TO THE BOTTOM OF THIS PAGE, I WAS ASKING QUESTIONS OF MYSELF, WHY ARE WE CREATING MORE AND MORE RADIOACTIVE ISOTOPES WITH A HALF LIFE OF MERE MILLISECONDS AND WHO FUNDS LIVERMORE AND OTHER LABS LIKE THEM. WE SHOULD BE FINDING NEW WAYS TO HEAL DISEASES, NOT HOW MANY WAYS CAN WE KILL MANKIND AND HOW FAST CAN WE DO IT! Electrons first identified by J.J. Thomson in 1896 by cathode ray experiment. But the electron's charge was measured by physicist Robert Millikan in their oil-drop experiment of 1909. Proton discovered by E. Goldstein as positively charged rays also known as canal rays in 1886 and later in 1932; James Chadwick identified uncharged particles of the atom as a neutron. The discovery of subatomic particles; electron, proton and neutron, displayed a clear image of an atom. Electrons are tiny, very light particles with negative electrical charge (-). Protons are much larger and heavier than electrons and have the opposite charge, a positive charge (+). Neutrons are large and heavy like protons; however neutrons have no electrical charge. Charge of electron and proton is equivalent that is 1.6 x 10-19 coulomb but with opposite sign. Mass of electron is negligible; that is 9.10938188 × 10-31 kg which contributes only 0.06% of total atomic mass. The pure chemical substances which contain a single type of atoms are known as a chemical element. The chemical elements can better distinguish by their atomic numbers which denotes the number of protons in an atom. On the basis of physical properties; elements can be classified as metals, non-metals and metalloids. Mostly elements are found in nature and known as natural elements but there are some artificial elements which are prepared in the laboratory and do not exist in nature. Let’s discuss natural elements in this article. The most important chemistry reference is the periodic table of elements. Scientist keep track of the natural elements on this chart. When we first look at the periodic table it looks very complicated. There are rows running left to right and columns running up and down. Plus there are different colors, numbers and symbols. As of 2010, there are 118 known elements. Of these 118 elements, 98 occur naturally on Earth. Ten of these occur in extreme trace quantities: technetium, atomic number 43; promethium, number 61; astatine, number 85; francium, number 87; neptunium, number 93; plutonium, number 94; americium, number 95; curium, number 96; berkelium, number 97; and californium, number 98. These 98 elements have been detected in the universe at large, in the spectra of stars and also supernovae, where short-lived radioactive elements are newly being made. The 98 natural elements are listed below. NOTE: Those of us who really pay attention to what is going on in the world, know that there are MORE elements than those listed here. Here is element 115, which we heard of first when John Lear and his buddy Bob Lazar were hanging out at Area 51 some years ago. Ununpentium is the temporary name of a synthetic superheavy element in theperiodic table that has the temporary symbol Uup and has the atomic number115. It is placed as a heavier homologue to bismuth and the heaviest member of group 15 (VA). It was first observed in 2003 and about 50 atoms of ununpentium have been synthesized to date, with about 25 direct decays of the parent element having been detected. Four consecutive isotopes are currently known, 287–290Uup, with 289Uup having the longest measured half-life of ~200 ms. On August 27, 2013, researchers at GSI from Lund University in Sweden reported confirming the existence of the element. On September 10, 2013, researchers from the same research group working in Darmstadt, Germany reported synthesis as well. Simulation of an accelerated calcium-48 ion about to collide with an americium-243 target atom. On February 2, 2004, synthesis of ununpentium was reported in Physical Review C by a team composed of Russian scientists at the Joint Institute for Nuclear Research in Dubna, and American scientists at the Lawrence Livermore National Laboratory. The team reported that they bombarded americium-243 with calcium-48 ions to produce four atoms of ununpentium. These atoms, they report, decayed by emission of alpha-particles to ununtrium in approximately 100 milliseconds. The Dubna–Livermore collaboration has strengthened their claim for the discovery of ununpentium by conducting chemical experiments on the decay daughter 268Db. 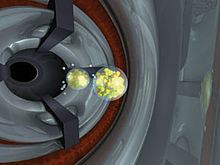 In experiments in June 2004 and December 2005, the dubnium isotope was successfully identified by milking the Db fraction and measuring anySF activities. Both the half-life and decay mode were confirmed for the proposed 268Db which lends support to the assignment of Z=115 to the parent nuclei. Sergei Dmitriev from the Flerov Laboratory of Nuclear Reactions (FLNR) in Dubna, Russia, has formally put forward their claim of discovery of ununpentium to the IUPAC/IUPAP Joint Working Party (JWP). In 2011, the IUPAC evaluated the Dubna–Livermore results and concluded that they did not meet the criteria for discovery. Ununpentium is historically known as eka-bismuth. Ununpentium is a temporary IUPAC systematic element name derived from the digits 115, where "un-" represents Latin unum. "Pent-" represents the Greek word for 5. For more, seesystematic element name. The team at Dubna are currently running another series of experiments on the243Am(48Ca,xn) reaction. They are attempting to complete the 4n excitation function and confirm the data for 287Uup. They are also hoping to identify some decays from the 2n and 5n exit channels. This reaction will run until the Christmas shutdown. The FLNR also have future plans to study light isotopes of element 115 using the reaction 241Am + 48Ca. A team of researchers at Lund University announced they had corroborated the 2004 findings in August 2013 by shooting calcium ions into a thin film of americium. Researchers at the GSI Helmholtz in Darmstadt, Germany reported the successful synthesis of ununpentium using the same reaction just two weeks later, on September 10, 2013. Hot fusion reactions are processes that create compound nuclei at high excitation energy (~40–50 MeV, therefore "hot"), leading to a reduced probability of survival from fission. The excited nucleus then decays to the ground state via the emission of 3–5 neutrons. Fusion reactions utilizing 48Ca nuclei usually produce compound nuclei with intermediate excitation energies (~30–35 MeV) and are sometimes referred to as "warm" fusion reactions. This leads, in part, to relatively high yields from these reactions. There are strong indications that this reaction was performed in late 2004 as part of a uranium(IV) fluoride target test at the GSI. No reports have been published, suggesting that no product atoms were detected, as anticipated by the team. This reaction was first performed by the team in Dubna in July–August 2003. In two separate runs, they were able to detect 3 atoms of 288Uup and a single atom of 287Uup. The reaction was studied further in June 2004 in an attempt to isolate the descendant 268Db from the 288Uup decay chain. After chemical separation of a +4/+5 fraction, 15 SF decays were measured with a lifetime consistent with 268Db. In order to prove that the decays were from dubnium-268, the team repeated the reaction in August 2005 and separated the +4 and +5 fractions and further separated the +5 fractions into tantalum-like and niobium-like ones. Five SF activities were observed, all occurring in the +5 fractions and none in the tantalum-like fractions, proving that the product was indeed isotopes of dubnium. In a series of experiments between October 2010 – February 2011, scientists at the FLNR studied this reaction at a range of excitation energies. They were able to detect 21 atoms of 288Uup and one atom of 289Uup, from the 2n exit channel. This latter result was used to support the synthesis of ununseptium. The 3n excitation function was completed with a maximum at ~8 pb. The data was consistent with that found in the first experiments in 2003. Ununpentium is projected to be the third member of the 7p series of chemical elements and the heaviest member of group 15 (VA) in the Periodic Table, below bismuth. In this group, each member is known to portray the group oxidation state of +V but with differing stability. For nitrogen, the +V state is very difficult to achieve due to the lack of low-lying d-orbitals and the inability of the small nitrogen atom to accommodate five ligands. The +V state is well represented for phosphorus, arsenic, and antimony. However, for bismuth it is rare due to the reluctance of the 6s2 electrons to participate in bonding. This effect is known as the "inert pair effect" and is commonly linked to relativistic stabilisation of the 6s-orbitals. It is expected that ununpentium will continue this trend and portray only +III and +I oxidation states. Nitrogen(I) and bismuth(I) are known but rare and ununpentium(I) is likely to show some unique properties. Because of spin-orbit coupling, flerovium may display closed-shell or noble gas-like properties; if this is the case, ununpentium will likely be monovalent as a result, since the cation Uup+ will have the same electron configuration as flerovium. Ununpentium should display eka-bismuth chemical properties and should therefore form a sesquioxide, Uup2O3, and analogouschalcogenides, Uup2S3, Uup2Se3 and Uup2Te3. It should also form trihydrides and trihalides, i.e. UupH3, UupF3, UupCl3, UupBr3 and UupI3. If the +V state is accessible, it is likely that it is only possible in the fluoride, UupF5. All the reported above isotopes of element 115, obtained by nuclear collisions of lighter nuclei, are severely neutron-deficient, because the proportion of neutrons to protons needed for maximum stability increases with atomic number. The most stable isotope will probably be 299Uup, with 184 neutrons, a known "magic" closed-shell number conferring exceptional stability, making it (with one further proton outside the "magic number" of 114 protons) both the chemical and the nuclear homolog of 209Bi; but the technology required to add the required neutrons presently does not exist. This is because no known combination of target and projectile can result in the required neutrons. It has been suggested that such a neutron-rich isotope could be formed by quasifission (fusion followed by fission) of a massive nucleus, multi-nucleon transfer reactions in collisions of actinidenuclei, or by the alpha decay of a massive nucleus (although this would depend on the stability of the parent nuclei towards spontaneous fission). ^ Jump up to:a b c d e f g Haire, Richard G. (2006). "Transactinides and the future elements". In Morss; Edelstein, Norman M.; Fuger, Jean. The Chemistry of the Actinide and Transactinide Elements (3rd ed.). Dordrecht, The Netherlands: Springer Science+Business Media. ISBN 1-4020-3555-1. ^ Jump up to:a b c d e f g Fricke, Burkhard (1975). "Superheavy elements: a prediction of their chemical and physical properties". Recent Impact of Physics on Inorganic Chemistry 21: 89–144. doi:10.1007/BFb0116498. Retrieved 4 October 2013. ^ Jump up to:a b Bonchev, Danail; Kamenska, Verginia (1981). "Predicting the Properties of the 113–120 Transactinide Elements". J. Phys. Chem. 85: 1177–1186. Jump up^ "Existence of new element confirmed". Lund University. 27 August 2013. Retrieved 27 August 2013. Jump up^ Staff (27 August 2013). "Scientists say existence of new element confirmed". Associated Press. Retrieved 27 August 2013. ^ Jump up to:a b "Phys. Rev. Lett. 111, 112502 (2013): Spectroscopy of Element 115 Decay Chains". Prl.aps.org. Retrieved 2013-09-28. Jump up^ Oganessian, Yu. Ts. ; Utyonkoy, V. K.; Lobanov, Yu. V. et al. (2004). "Experiments on the synthesis of element 115 in the reaction 243Am(48Ca,xn)291−x115". Physical Review C 69(2): 021601. Bibcode:2004PhRvC..69b1601O.doi:10.1103/PhysRevC.69.021601. Jump up^ Oganessian et al. (2003). "Experiments on the synthesis of element 115 in the reaction 243Am(48Ca,xn)291−x115".JINR preprints. Jump up^ Dmitriev, S. N. (2005). "Results of the Experiment for Chemical Identification of Db as a Decay Product of Element 115". In Penionzhkevich, Yu. E.; Cherepanov, E. A.International Symposium on Exotic Nuclei: Peterhof, Russia, July 5-12, 2004. Hackensack: World Scientific. pp. 285–294.Bibcode:2005exnu.conf..285D.doi:10.1142/9789812701749_0040. ISBN 9789812701749.OCLC 77501503. Jump up^ Oganessian, Yu. Ts. ; Utyonkov, V.; Dmitriev, S.; Lobanov, Yu. ; Itkis, M.; Polyakov, A.; Tsyganov, Yu. ; Mezentsev, A. et al. (2005). "Synthesis of elements 115 and 113 in the reaction 243Am+48Ca". Physical Review C 72 (3): 034611.Bibcode:2005PhRvC..72c4611O.doi:10.1103/PhysRevC.72.034611. Jump up^ "Project: Priority claims for the discovery of elements with atomic number greater than 111". IUPAC. Retrieved 2009-07-07. Jump up^ Barber, Robert C.; Karol, Paul J.; Nakahara, Hiromichi; Vardaci, Emanuele; Vogt, Erich W. (2011). "Discovery of the elements with atomic numbers greater than or equal to 113 (IUPAC Technical Report)". Pure and Applied Chemistry 83(7): 1. doi:10.1351/PAC-REP-10-05-01. Jump up^ "Study of heavy and superheavy nuclei (see experiment 1.5)". Flerov Laboratory of Nuclear Reactions. Jump up^ "Spectroscopy of element 115 decay chains (Accepted for publication on Physical Review Letters on 9 August 2013)". Retrieved 2 September 2013. Jump up^ Zagrebaev, V (2004). "Fusion-fission dynamics of super-heavy element formation and decay". Nuclear Physics A734: 164. Bibcode:2004NuPhA.734..164Z.doi:10.1016/j.nuclphysa.2004.01.025. Jump up^ Feng, Z; Jin, G; Li, J; Scheid, W (2009). "Production of heavy and superheavy nuclei in massive fusion reactions".Nuclear Physics A 816: 33. arXiv:0803.1117.Bibcode:2009NuPhA.816...33F.doi:10.1016/j.nuclphysa.2008.11.003. Jump up^ "List of experiments 2000–2006". Univerzita Komenského v Bratislave. Archived from the original on 2007-07-23. Jump up^ Keller, O. L., Jr.; C. W. Nestor, Jr. (1974). "Predicted properties of the superheavy elements. III. Element 115, Eka-bismuth". Journal of Physical Chemistry 78 (19): 1945.doi:10.1021/j100612a015. Ununoctium is the temporary IUPAC name for the transactinide element with the atomic number 118 and temporary element symbol Uuo. It is also known aseka-radon or element 118, and on the periodic table of the elements it is a p-block element and the last one of the 7th period. Ununoctium is currently the onlysynthetic member of group 18. It has the highest atomic number and highestatomic mass of all the elements discovered so far. The radioactive ununoctium atom is very unstable, due to its high mass, and since 2005, only three or possibly four atoms of the isotope 294Uuo have been detected. While this allowed very little experimental characterization of its properties and possible compounds, theoretical calculations have resulted in many predictions, including some unexpected ones. For example, although ununoctium is a member of group 18, it may possibly not be a noble gas, unlike all the other group 18 elements. It was formerly thought to be a gas undernormal conditions but is now predicted to be a solid due to relativistic effects. The first decay of atoms of ununoctium was observed at the Joint Institute for Nuclear Research (JINR) by Yuri Oganessian and his group in Dubna, Russia, in 2002. On October 9, 2006, researchers from JINR and Lawrence Livermore National Laboratory of California, US, working at the JINR in Dubna, announced that they had indirectly detected a total of three (possibly four) nuclei of ununoctium-294 (one or two in 2002and two more in 2005) produced via collisions of californium-249 atoms and calcium-48 ions. Radioactive decay pathway of the isotope ununoctium-294.The decay energy and average half-life is given for the parent isotopeand each daughter isotope. The fraction of atoms undergoingspontaneous fission (SF) is given in green. In 2011, IUPAC evaluated the 2006 results of the Dubna-Livermore collaboration and concluded: "The three events reported for the Z = 118 isotope have very good internal redundancy but with no anchor to known nuclei do not satisfy the criteria for discovery". 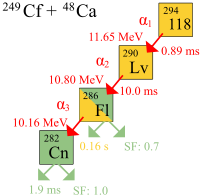 Because of the very small fusion reaction probability (the fusion cross section is~0.3–0.6 pb or (3–6)×10−41 m2) the experiment took four months and involved a beam dose of 4×1019 calcium ions that had to be shot at the californium target to produce the first recorded event believed to be the synthesis of ununoctium. Nevertheless, researchers are highly confident that the results are not a false positive, since the chance that the detections were random events was estimated to be less than one part in100000. Cn, which will undergo spontaneous fission. −0.18 ms with the experimental Q-value published in 2004. Calculation with theoretical Q-values from the macroscopic-microscopic model of Muntian–Hofman–Patyk–Sobiczewski gives somewhat low but comparable results. Until the 1960s ununoctium was known as eka-emanation (emanation is the old name for radon). In 1979 the IUPACpublished recommendations according to which the element was to be called ununoctium, a systematic element name, as aplaceholder until the discovery of the element is confirmed and the IUPAC decides on a name. The Russian discoverers reported their synthesis in 2006. In 2007, the head of the Russian institute stated the team were considering two names for the new element: flyorium, in honor of Georgy Flyorov, the founder of the research laboratory in Dubna; and moskovium, in recognition of the Moscow Oblast where Dubna is located. He also stated that although the element was discovered as an American collaboration, who provided the californium target, the element should rightly be named in honor of Russia since the Flerov Laboratory of Nuclear Reactions at JINR was the only facility in the world which could achieve this result. These names were later proposed for element 114 (flerovium) and element 116 (moscovium). However, the final name proposed for element 116 was instead livermorium. No name has yet been officially suggested for the element as no claims for discovery have yet been accepted by the IUPAC. According to current guidelines from IUPAC, the ultimate name for all new elements should end in "-ium", which means the name for ununoctium will almost certainly end in "-ium", not "-on", even if ununoctium turns out to be a noble gas, which traditionally have names ending in "-on" (with the exception of helium, which was not known to be a noble gas when it was discovered). Ununoctium (row 118) is slightly above the "island of stability" (white circle) and thus its nuclei are slightly more stable than otherwise predicted. The stability of nuclei decreases greatly with the increase in atomic number after plutonium, the heaviest primordial element, so that all isotopes with an atomic number above101 decay radioactively with a half-life under a day, with an exception of dubnium-268. No elements with atomic numbers above 82 (after lead) have stable isotopes. Nevertheless, because of reasons not very well understood yet, there is a slight increased nuclear stability around atomic numbers 110–114, which leads to the appearance of what is known in nuclear physics as the "island of stability". This concept, proposed by University of California professor Glenn Seaborg, explains why superheavy elements last longer than predicted. Ununoctium is radioactive and has a half-life that appears to be less than a millisecond. Nonetheless, this is still longer than some predicted values, thus giving further support to the idea of this "island of stability". Calculations using a quantum-tunneling model predict the existence of several neutron-rich isotopes of ununoctium with alpha-decay half-lives close to 1 ms. Theoretical calculations done on the synthetic pathways for, and the half-life of, other isotopes have shown that some could be slightly more stable than the synthesized isotope 294Uuo, most likely 293Uuo, 295Uuo, 296Uuo, 297Uuo, 298Uuo, 300Uuo and302Uuo. Of these, 297Uuo might provide the best chances for obtaining longer-lived nuclei, and thus might become the focus of future work with this element. Some isotopes with many more neutrons, such as some located around 313Uuo could also provide longer-lived nuclei. Ununoctium is a member of group 18, the zero-valence elements. The members of this group are usually inert to most common chemical reactions (for example, combustion) because the outer valence shell is completely filled with eight electrons. This produces a stable, minimum energy configuration in which the outer electrons are tightly bound. It is thought that similarly, ununoctium has a closed outer valence shell in which its valence electrons are arranged in a 7s27p6 configuration. Consequently, some expect ununoctium to have similar physical and chemical properties to other members of its group, most closely resembling the noble gas above it in the periodic table, radon. Following the periodic trend, ununoctium would be expected to be slightly more reactive than radon. However, theoretical calculations have shown that it could be quite reactive, so that it probably cannot be considered a noble gas. In addition to being far more reactive than radon, ununoctium may be even more reactive than elements flerovium and copernicium. The reason for the apparent enhancement of the chemical activity of ununoctium relative to radon is an energetic destabilization and a radial expansion of the last occupied 7p-subshell. More precisely, considerable spin–orbit interactions between the 7p electrons with the inert 7s2 electrons, effectively lead to a second valence shell closing at flerovium, and a significant decrease in stabilization of the closed shell of element 118. It has also been calculated that ununoctium, unlike other noble gases, binds an electron with release of energy—or in other words, it exhibits positive electron affinity. Ununoctium is expected to have by far the broadest polarizability of all elements before it in the periodic table, and almost twofold of radon. By extrapolating from the other noble gases, it is expected that ununoctium has a boiling point between 320 and 380 K. This is very different from the previously estimated values of 263 K or 247 K. Even given the large uncertainties of the calculations, it seems highly unlikely that ununoctium would be a gas under standard conditions, and as the liquid range of the other gases is very narrow, between 2 and 9 kelvins, this element should be solid at standard conditions. If ununoctium forms a gas under standard conditions nevertheless, it would be one of the densest gaseous substances at standard conditions (even if it is monatomic like the other noble gases). Because of its tremendous polarizability, ununoctium is expected to have an anomalously low ionization energy (similar to that of lead which is 70% of that of radon and significantly smaller than that of flerovium) and a standard state condensed phase. 4 has a square planar configuration. 4 is predicted to have a tetrahedral configuration. No compounds of ununoctium have been synthesized yet, but calculations on theoretical compoundshave been performed since 1964. It is expected that if the ionization energy of the element is high enough, it will be difficult to oxidize and therefore, the most common oxidation state will be 0 (as for other noble gases); nevertheless, this appears not to be the case. 2 by 0.16 Å, which would be indicative of a significant bonding interaction. On the other hand, the compound UuoH+ exhibits a dissociation energy (in other words proton affinity of Uuo) that is smaller than that of RnH+. 4 is also expected to have. The Uuo–F bond will most probably be ionic rather than covalent, rendering the UuoFn compounds non-volatile. UuoF2 is predicted to be partiallyionic due to ununoctium's high electropositivity. Unlike the other noble gases (except possibly xenon), ununoctium was predicted to be sufficiently electropositive to form a Uuo–Cl bond with chlorine. Jump up^ The actual quote is "The reason for the apparent enhancement of chemical activity of element 118 relative to radon is the energetic destabilization and radial expansion of its occupied 7p3/2 spinor shell." Jump up^ Nevertheless, quantum electrodynamic corrections have been shown to be quite significant in reducing this affinity by decreasing the binding in the anion Uuo− by 9%, thus confirming the importance of these corrections in superheavy elements. See Pyykkö. Jump up^ It is debatable if the name of the group "noble gases" will be changed if ununoctium is shown to be non-volatile. ^ Jump up to:a b c d e f g h i j k l m n o p Nash, Clinton S. (2005). "Atomic and Molecular Properties of Elements 112, 114, and 118". Journal of Physical Chemistry A 109 (15): 3493–3500.doi:10.1021/jp050736o. PMID 16833687. ^ Jump up to:a b c d Haire, Richard G. (2006). "Transactinides and the future elements". In Morss; Edelstein, Norman M.; Fuger, Jean. The Chemistry of the Actinide and Transactinide Elements (3rd ed.). Dordrecht, The Netherlands: Springer Science+Business Media. p. 1724. ISBN 1-4020-3555-1. Jump up^ Bonchev, Danail; Kamenska, Verginia (1981). "Predicting the Properties of the 113–120 Transactinide Elements". J. Phys. Chem. 85: 1177–1186. ^ Jump up to:a b c d e f Han, Young-Kyu; Bae, Cheolbeom; Son, Sang-Kil; Lee, Yoon Sup (2000). "Spin–orbit effects on the transactinide p-block element monohydrides MH (M=element 113–118)". Journal of Chemical Physics 112 (6): 2684.Bibcode:2000JChPh.112.2684H. doi:10.1063/1.480842. ^ Jump up to:a b c d e Kaldor, Uzi; Wilson, Stephen (2003). Theoretical Chemistry and Physics of Heavy and Superheavy Elements. Springer. p. 105. ISBN 140201371X. Retrieved 2008-01-18. ^ Jump up to:a b c Fricke, Burkhard (1975). "Superheavy elements: a prediction of their chemical and physical properties".Recent Impact of Physics on Inorganic Chemistry 21: 89–144. doi:10.1007/BFb0116498. Retrieved 4 October 2013. ^ Jump up to:a b "Ununoctium". WebElements Periodic Table. Retrieved 2007-12-09. Jump up^ Wieser, M.E. (2006). "Atomic weights of the elements 2005 (IUPAC Technical Report)". Pure Appl. Chem. 78 (11): 2051–2066. doi:10.1351/pac200678112051. Jump up^ "The Top 6 Physics Stories of 2006". Discover Magazine. 2007-01-07. Retrieved 2008-01-18. ^ Jump up to:a b Smolanczuk, R. (1999). "Production mechanism of superheavy nuclei in cold fusion reactions". Physical ReviewC 59 (5): 2634–2639. Bibcode:1999PhRvC..59.2634S.doi:10.1103/PhysRevC.59.2634. Jump up^ Ninov, Viktor (1999). "Observation of Superheavy Nuclei Produced in the Reaction of 86Kr with 208Pb". Physical Review Letters 83 (6): 1104–1107.Bibcode:1999PhRvL..83.1104N.doi:10.1103/PhysRevLett.83.1104. Jump up^ Service, R. F. (1999). "Berkeley Crew Bags Element 118".Science 284 (5421): 1751.doi:10.1126/science.284.5421.1751. Jump up^ Public Affairs Department (2001-07-21). "Results of element 118 experiment retracted". Berkeley Lab. Retrieved 2008-01-18. Jump up^ Dalton, R. (2002). "Misconduct: The stars who fell to Earth". Nature 420 (6917): 728–729.Bibcode:2002Natur.420..728D. doi:10.1038/420728a.PMID 12490902. Jump up^ Element 118 disappears two years after it was discovered. Physicsworld.com. Retrieved on 2012-04-02. Ca experiment". JINR Communication (JINR, Dubna). Jump up^ Oganessian, Yu. T. et al. (2002). "Element 118: results from the first 249Cf + 48Ca experiment". Communication of the Joint Institute for Nuclear Research. Jump up^ "Livermore scientists team with Russia to discover element 118". Livermore press release. 2006-12-03. Retrieved 2008-01-18. Jump up^ Oganessian, Yu. T. (2006). "Synthesis and decay properties of superheavy elements". Pure Appl. Chem. 78 (5): 889–904. doi:10.1351/pac200678050889. Jump up^ Sanderson, K. (2006). "Heaviest element made – again".Nature News (Nature). doi:10.1038/news061016-4. Jump up^ Schewe, P. and Stein, B. (2006-10-17). "Elements 116 and 118 Are Discovered". Physics News Update. American Institute of Physics. Retrieved 2008-01-18. Jump up^ Weiss, R. (2006-10-17). "Scientists Announce Creation of Atomic Element, the Heaviest Yet". Washington Post. Retrieved 2008-01-18. Jump up^ "Element 118 Detected, With Confidence". Chemical and Engineering news. 2006-10-17. Retrieved 2008-01-18. "I would say we're very confident." ^ Jump up to:a b c d Chowdhury, Roy P.; Samanta, C.; Basu, D. N. (2006). "α decay half-lives of new superheavy elements".Phys. Rev. C 73: 014612. arXiv:nucl-th/0507054.Bibcode:2006PhRvC..73a4612C.doi:10.1103/PhysRevC.73.014612. Jump up^ Samanta, C.; Chowdhury, R. P.; Basu, D.N. (2007). "Predictions of alpha decay half-lives of heavy and superheavy elements". Nucl. Phys. A 789: 142–154. arXiv:nucl-th/0703086. Bibcode:2007NuPhA.789..142S.doi:10.1016/j.nuclphysa.2007.04.001. ^ Jump up to:a b Grosse, A. V. (1965). "Some physical and chemical properties of element 118 (Eka-Em) and element 86 (Em)".Journal of Inorganic and Nuclear Chemistry (Elsevier Science Ltd.) 27 (3): 509–19. doi:10.1016/0022-1902(65)80255-X. Jump up^ Chatt, J. (1979). "Recommendations for the Naming of Elements of Atomic Numbers Greater than 100". Pure Appl. Chem. 51 (2): 381–384. doi:10.1351/pac197951020381. Jump up^ "Discovery of New Elements Makes Front Page News". Berkeley Lab Research Review Summer 1999. 1999. Retrieved 2008-01-18. Jump up^ "New chemical elements discovered in Russia`s Science City". 2007-02-12. Retrieved 2008-02-09. Jump up^ Yemel'yanova, Asya (2006-12-17). "118-й элемент назовут по-русски (118th element will be named in Russian)" (in Russian). vesti.ru. Retrieved 2008-01-18. Jump up^ "Российские физики предложат назвать 116 химический элемент московием (Russian Physicians Will Suggest to Name Element 116 Moscovium)" (in Russian). rian.ru. 2011. Retrieved 2011-05-08. Jump up^ "News: Start of the Name Approval Process for the Elements of Atomic Number 114 and 116". International Union of Pure and Applied Chemistry. Retrieved 2 December 2011. Jump up^ Koppenol, W. H. (2002). "Naming of new elements (IUPAC Recommendations 2002)". Pure and Applied Chemistry 74(5): 787. doi:10.1351/pac200274050787. Jump up^ Marcillac, Pierre de; Noël Coron, Gérard Dambier, Jacques Leblanc, and Jean-Pierre Moalic (April 2003). "Experimental detection of α-particles from the radioactive decay of natural bismuth". Nature 422 (6934): 876–878.Bibcode:2003Natur.422..876D. doi:10.1038/nature01541.PMID 12712201. Jump up^ Considine, Glenn D.; Kulik, Peter H. (2002). Van Nostrand's scientific encyclopedia (9 ed.). Wiley-Interscience.ISBN 978-0-471-33230-5. OCLC 223349096. Jump up^ Oganessian, Yu. T. (2007). "Heaviest nuclei from 48Ca-induced reactions". Journal of Physics G: Nuclear and Particle Physics 34 (4): R165–R242.Bibcode:2007JPhG...34..165O. doi:10.1088/0954-3899/34/4/R01. Jump up^ "New Element Isolated Only Briefly". The Daily Californian. 2006-10-18. Retrieved 2008-01-18. Jump up^ Chowdhury, Roy P.; Samanta, C.; Basu, D. N. (2008). "Search for long lived heaviest nuclei beyond the valley of stability". Physical Reviews C 77 (4): 044603.arXiv:0802.3837. Bibcode:2008PhRvC..77d4603C.doi:10.1103/PhysRevC.77.044603. Jump up^ Chowdhury, R. P.; Samanta, C.; Basu, D.N. (2008). "Nuclear half-lives for α -radioactivity of elements with 100 ≤ Z ≤ 130". At. Data & Nucl. Data Tables 94 (6): 781–806.arXiv:0802.4161. Bibcode:2008ADNDT..94..781C.doi:10.1016/j.adt.2008.01.003. ^ Jump up to:a b Royer, G.; Zbiri, K.; Bonilla, C. (2004). "Entrance channels and alpha decay half-lives of the heaviest elements". Nuclear Physics A 730 (3–4): 355–376. arXiv:nucl-th/0410048. Bibcode:2004NuPhA.730..355R.doi:10.1016/j.nuclphysa.2003.11.010. Jump up^ Duarte, S. B.; Tavares, O. A. P.; Gonçalves, M.; Rodríguez, O.; Guzmán, F.; Barbosa, T. N.; García, F.; Dimarco, A. (2004). "Half-life predictions for decay modes of superheavy nuclei". Journal of Physics G: Nuclear and Particle Physics 30 (10): 1487–1494.Bibcode:2004JPhG...30.1487D. doi:10.1088/0954-3899/30/10/014. Jump up^ Bader, Richard F.W. "An Introduction to the Electronic Structure of Atoms and Molecules". McMaster University. Retrieved 2008-01-18. Jump up^ "Ununoctium (Uuo) – Chemical properties, Health and Environmental effects". Lenntech. Archived from the original on January 16, 2008. Retrieved 2008-01-18. Jump up^ Goidenko, Igor; Labzowsky, Leonti; Eliav, Ephraim; Kaldor, Uzi; Pyykko¨, Pekka (2003). "QED corrections to the binding energy of the eka-radon (Z=118) negative ion". Physical Review A 67 (2): 020102(R).Bibcode:2003PhRvA..67b0102G.doi:10.1103/PhysRevA.67.020102. Jump up^ Eliav, Ephraim; Kaldor, Uzi; Ishikawa, Y; Pyykkö, P (1996). "Element 118: The First Rare Gas with an Electron Affinity".Physical Review Letters 77 (27): 5350–5352.Bibcode:1996PhRvL..77.5350E.doi:10.1103/PhysRevLett.77.5350. PMID 10062781. Jump up^ Seaborg, Glenn Theodore (1994). Modern Alchemy. World Scientific. p. 172. ISBN 981-02-1440-5. Jump up^ Takahashi, N. (2002). "Boiling points of the superheavy elements 117 and 118". Journal of Radioanalytical and Nuclear Chemistry 251 (2): 299–301.doi:10.1023/A:1014880730282. Jump up^ Nash, Clinton S.; Bursten, Bruce E. (1999). "Spin-Orbit Effects, VSEPR Theory, and the Electronic Structures of Heavy and Superheavy Group IVA Hydrides and Group VIIIA Tetrafluorides. A Partial Role Reversal for Elements 114 and 118". Journal of Physical Chemistry A 1999 (3): 402–410.doi:10.1021/jp982735k. Jump up^ "Ununoctium: Binary Compounds". WebElements Periodic Table. Retrieved 2008-01-18. ^ Jump up to:a b Han, Young-Kyu; Lee, Yoon Sup (1999). "Structures of RgFn (Rg = Xe, Rn, and Element 118. n = 2, 4.) Calculated by Two-component Spin-Orbit Methods. A Spin-Orbit Induced Isomer of (118)F4". Journal of Physical Chemistry A 103 (8): 1104–1108. doi:10.1021/jp983665k. Jump up^ Pitzer, Kenneth S. (1975). "Fluorides of radon and element 118". Journal of the Chemical Society, ChemicalCommunications (18): 760–761.doi:10.1039/C3975000760b. ^ Jump up to:a b Seaborg (c. 2006). "transuranium element (chemical element)". Encyclopædia Britannica. Retrieved 2010-03-16. Jump up^ 张青莲 (November 1991). 《无机化学丛书》第一卷：稀有气体、氢、碱金属. Beijing: Science Press. pp. P72. ISBN 7-03-002238-6. Jump up^ Proserpio, Davide M.; Hoffmann, Roald; Janda, Kenneth C. (1991). "The xenon-chlorine conundrum: van der Waals complex or linear molecule?". Journal of the American Chemical Society 113 (19): 7184.doi:10.1021/ja00019a014.